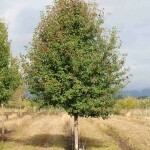 A rounded tree with glossy dark green foliage. 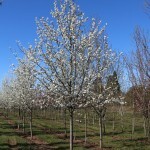 Has improved structure over 'Bradford' pear, creating a stronger tree for the landscape. It has white flowers in the early spring and purple-red fall color. It prefers full sun in an organically rich, well-drained soil with consisent summer moisture. It is adaptable to a wide range of soils including heavy clay.